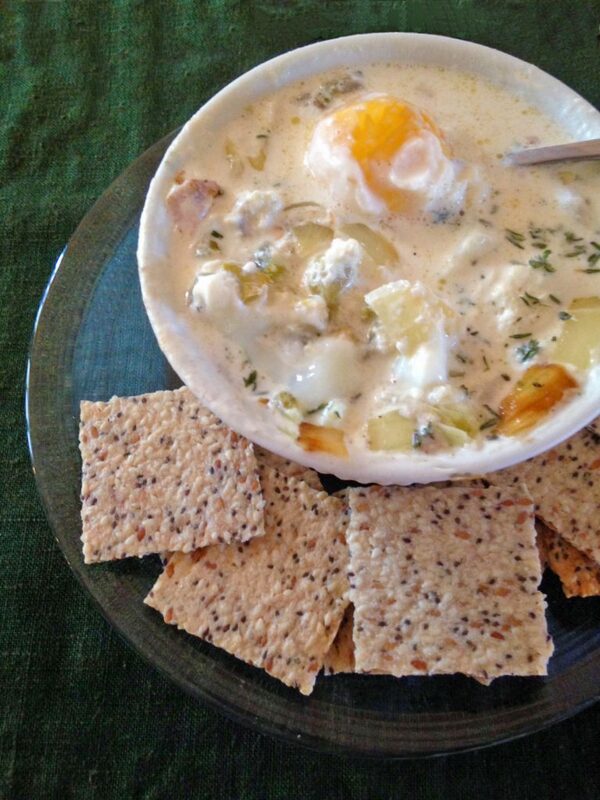 Eggs-in-a-cup is easier than an omelette and a great way to mix-n-match a variety of vegetables. Even though it might look like eggs-in-a-cup is on the more elaborate end of the egg dish scale, this method of egg preparation is half the effort of making an omelette, and just as delicious! After a basic “how-to” your culinary imagination can do the rest to create a tasty breakfast, or even a light summer dinner, in about 20 minutes. Eggs-in-a-cup lets you make great use of food scraps, such as mushroom stems, zucchini heels, tomato ends, and more. Anything that you would put in an omelette can be used in this recipe. And this is a great way to get kids more involved in the kitchen because they can create their own customized egg dish, as they safely experiment with different foods. All you need is a deep, lidded pan for the stovetop, and one-cup (or larger) ramekins, bowls, or cups. Chop your vegetables into 1/2-inch cubes or smaller, and sauté them in a skillet briefly in your choice of olive oil, coconut oil, or butter, until they are lightly wilted. Add herbs, spices, salt, and pepper and stir until combined. Remove your skillet from the heat and let the vegetable mixture cool for two minutes or so, then add the cream, stirring until combined, and scraping up any bits from the bottom of your pan. (If you add the cream to a hot pan, it will curdle). 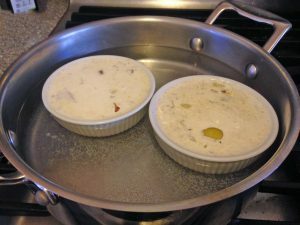 Place your ramekins or bowls into a deep (about 4″ or so), stove-top safe, pan. Spoon the vegetable and cream mixture into the bottom of each ramekin, small cup, or bowl until it is about 1/2 way up the container to allow room for the eggs. Simmer the water, being careful not to let the water boil, or the egg mixture will boil over. Gently break the eggs, and add them to each cup, being careful to leave the yolks whole. Add boiling water half way up the ramekins or bowls. Cover the pan, turn the heat to low, and bring the water to a simmer (if the water boils, your egg mixture will likely boil over, too). Let the eggs steam for about six minutes (you can choose more or less time depending upon how runny you’d like your eggs). After three minutes, remove the cover and see if the eggs are done to your liking, then steam for additional time, if desired. 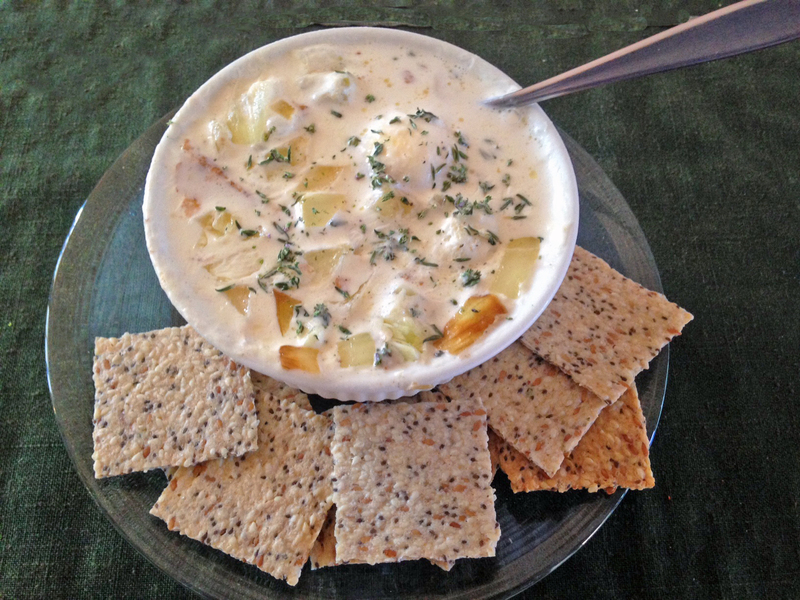 Carefully remove the ramekins, and serve with crusty bread or crackers, and a fresh salad.